Crews work to plant dozens of trees that will add greenery and beauty to JFK Boulevard and Landis Avenue. The dead, leafless trees along JFK Boulevard and Landis Avenue are gone now. 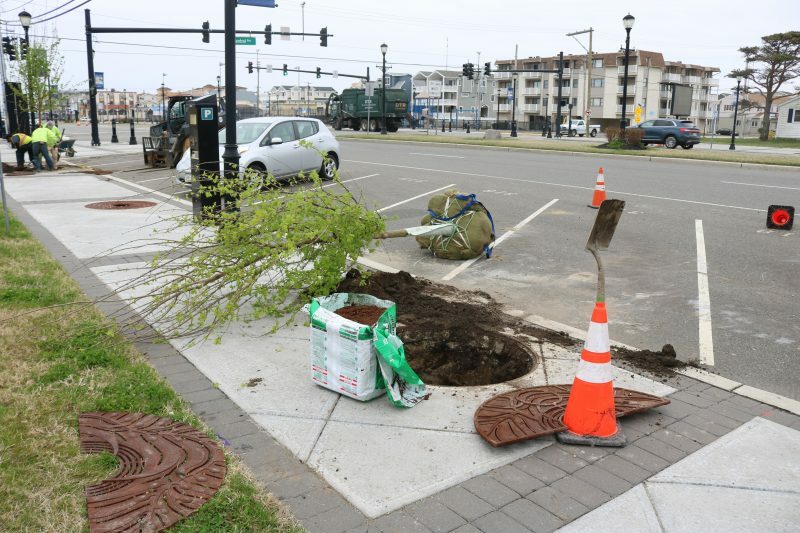 Being planted in their place are dozens of new maples and magnolias that will give Sea Isle City’s main entryway an eye-catching canopy of green. 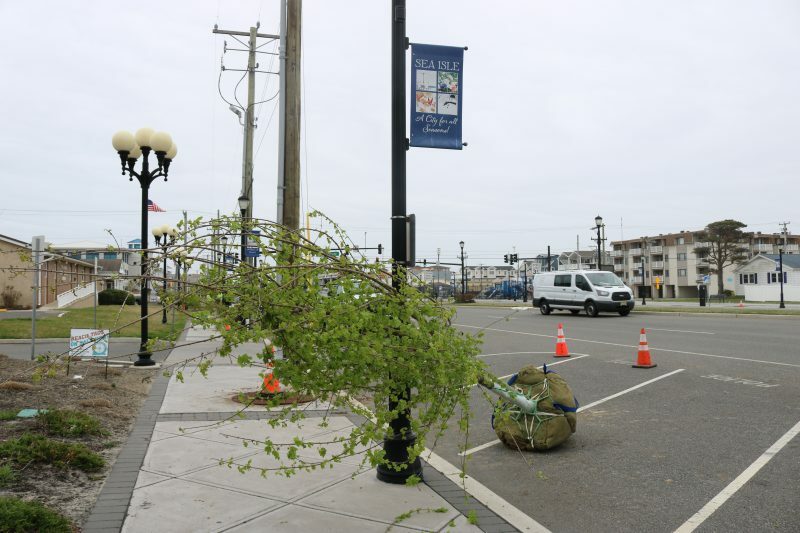 “Not only will these new trees beautify our city’s main entrance, they will also add shade during the summer months and serve as habitat for local wildlife,” Sea Isle Public Information Officer Katherine Custer said. In January, City Council authorized the award of a $98,000 contract for the tree planting project to Think Pavers Hardscaping, LLC, of Mount Royal, N.J. 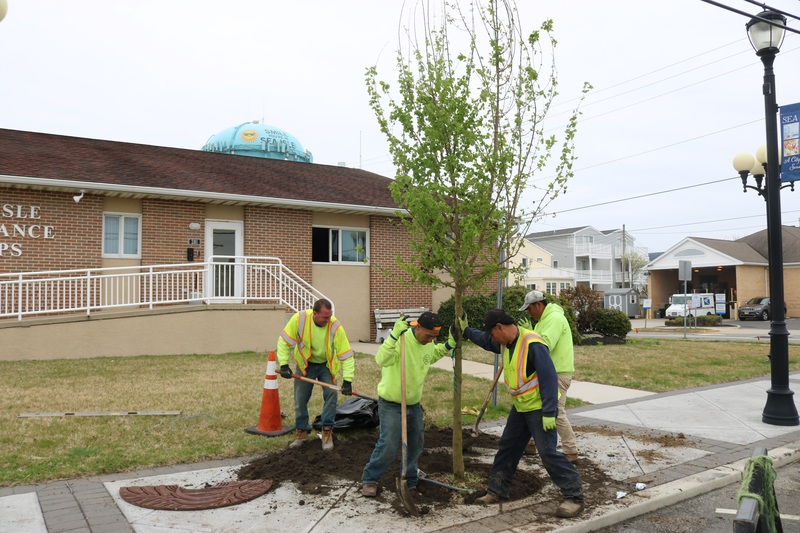 The project began on April 8 and includes the planting of 40 Trident Maple trees on JFK Boulevard (both north and south sides) as well as 35 Sweetbay Magnolia trees on Landis Avenue (both east and west sides from 39th Street to 43rd Street). Planting is anticipated to be completed by the end of April. However, weather could impact that end date, Custer noted. The contract includes a two-year maintenance plan that will start upon acceptance of planting. Custer said that the trees are salt-tolerant and conducive for the shore environment. “The planting process is currently underway, but I am not sure when the project will be completed. Weather is a factor, etc., but obviously they already have numerous trees in place,” she pointed out. A new tree awaits planting along the JFK Boulevard entryway. The old trees that died were leftovers from the multimillion-dollar “Beach to Bay” beautification of JFK Boulevard, which was completed in 2013. A series of road, landscaping, safety and municipal projects were added to the central corridor stretching from the city’s marina to the beachfront Promenade over a five-year span. The planting project was a collaboration between different members of the community. “Representatives from Sea Isle City’s Department of Public Works, Environmental Commission, Shade Tree Committee and Green Team worked together to bring this project to fruition – and the results are already very impressive,” Custer emphasized. She said the plantings are having a positive impact on the city’s Arbor Day Celebration. The Arbor Day Celebration is co-hosted by the Historical Society, Garden Club and Environmental Commission. The maples and magnolias will provide shade cover in the summer season.